Writing this as a 26 year old may seem strange or ironic to some, but one of the most rewarding parts of my job is facilitating improved quality of golf (and life) for some of my older clients. “Old” is a subjective term, that must not be identified simply by the number of years one has been alive. The level of physical function, and health one has is a far better metric. For the sake of this article I want everybody to consider they are “old”. The reason for this is that in my opinion the training programs for people of all ages should have similar goals. Additionally, the younger one can start taking ownership of their physical function the easier it is to develop high levels of athleticism, providing a very tall peak from which their imminent eventual physical decline can begin. Just as importantly, nobody is “too old” to start improving their physical function, even though it is a common gripe I hear. One’s response to a training stimulus may diminish as the years roll on, but this absolutely does not mean one has an excuse to stop training if extending one’s quality & enjoyment of golf (and everyday life) is a goal. This is a longer article than most I have written but if there is one piece of my work you share with family, friends, loved ones, co-workers etc please let it be this. I believe it contains a very important but poorly understood message. I have worked with many people between the ages of 60-80, and have witnessed both the exceptional levels of physical function that can be developed and maintained if one is disciplined with an appropriate training regime throughout their life. Likewise the transformation that can be made by people who take to training in their fifth, sixth, seventh, or eighth decade can also make astounding progress. It’s never too late. I haven’t yet had the pleasure of working with anyone in their ninth or tenth decade but I’m sure it’s around the corner. If anyone reading meets this criteria please get in touch! The aim of this article is to shed some light on why it is absolutely critical that “older” golfers/adults should have some strength and speed/power training in their exercise programs. I will try my best to provide a breakdown of the latest research in these areas of training in “older” populations, and share how I combine it with my practical experience to implement it into their training programs. The vast majority of golfers experience a significant loss in club head speed and distance as they age. It’s a complaint I have heard from pretty much every golfer I have trained who is into their 50’s, and certainly 60’s. Golf score, and either directly or indirectly, level of enjoyment from the game starts to decline as this speed reduction occurs. Let’s make one point very clear. It’s not your chronological age that is primarily responsible for the decline in distance, it is your drop in strength and speed/power. There is a huge difference, because chronological age cannot be changed, but strength, power and speed levels most certainly can….at any age. Why Does Club Head Speed Drop Off With Age? By understanding the mechanisms that underlie this drop off in speed it becomes much easier to try and apply appropriate training interventions. Decrease in Muscle Activity / Neural Drive: To carry out a movement, our Central Nervous System (CNS) must activate motor units (MU’s). Motor units are comprised of a motor neuron (nerve), and the muscle fibres that it innervates. In an effort to avoid complexity, the more MU’s that are recruited, and the faster that these signals to recruit MU’s are sent from the CNS, the stronger and faster our movements can be. This is of course extremely important for generating high club head speed. It has been well established that as one ages there is a loss in working MU’s which means generating high levels of force and speed becomes more difficult. Shift In Muscle Fibre Type: Going quickly back to MU’s, it should be noted that all muscle fibers in an MU are the same type. You have probably heard of “fast twitch” and “slow twitch” muscle fibers, and these differences in muscle fiber type are very real and very important. Fast twitch muscle fibers are capable of much faster, and stronger contractions, and are therefore vital for explosive movements like the golf swing. It is well established that as one ages, there is a decrease in the size and amount of these fast twitch muscle fibers. There is also some debate that fast twitch fibres start to “convert” to slow twitch fibers, and become innervated by a slow twitch neuron. Slow twitch muscle fibers are great for endurance activities, but not an explosive action like the golf swing. Interestingly, slow twitch fibers don’t degrade anywhere near as much with age, compared to the fast twitch counterparts. Sarcopenia: This is the term given to the loss of muscle size and strength due to aging. Muscle power, which is a combination of force and velocity does not receive the same attention but it certainly warrants it. Due to the selective atrophy and loss of fast twitch fibers, and other more complex nervous system factors, muscle power is lost at approximately twice the rate of muscle strength (Skelton et al 1994). This is a very important point to note if maintaining high club head speed is a goal. With similar levels of muscle mass, and maximum strength, elderly populations tend to have much lower power levels. So even though an older person may feel or look “in shape”, without training it’s likely their power and speed has degraded. While the information above may make it seem all hope is lost, the great thing about muscle, and the CNS is that they’re very responsive to training, even in “old” people. The key word here is “training”. Recreational activity, or general exercise is not the same thing, and the training must meet some specific criteria for maximum benefit to be attained. In particular, there are two types of training that have massive benefit for reversing/delaying the loss of muscle power in aging populations. The first is strength training, which concentrates on developing the maximum force one can exert in a particular movement. With strength training, our primary goal is force production. This is best accomplished with a “”heavy” load, relative to the person’s strength level. For the sake of this discussion let’s classify heavy as the most load someone can use in a particular exercise and complete 3-6 perfect reps, but no more. The second type is usually labelled under speed & power training. Another term for this is Rate of Force Development (RFD). RFD is usually classified as the amount of force generated in the first 200ms of muscular contraction. This is the vital difference between strength and RFD. Strength measures do not take the time to produce maximum force into consideration, while RFD is concerned with the maximum amount of force that can be produced very quickly (usually classified as the first 200ms of contraction). This is important to understand and take note of because there is a difference in how quickly older populations decline in strength, compared to RFD. As alluded to earlier RFD declines much more rapidly. Due to very short, explosive nature of the golf swing, RFD is a critical component of high club head speed so increasing or maintaining it for as long as possible is an important training consideration. Maximum Strength Training: Wang et al (2016) performed a study involving 11 males with an average age of 72 (+/- 3 years), and 13 males with an average age of 24 (+/- 2 years). The younger group acted as a control, and did not complete the training intervention, they were just tested at the beginning for comparison purposes. Both groups were healthy, but neither group performed strength training as part of their regular activity. The researchers obtained a one repetition maximum (1RM) squat in a hack squat machine, to 90 degrees of knee flexion. (1RM is the most weight one can lift in a particular exercise for one repetition, and is a common strength test procedure). 3 times per week for 8 weeks the elderly group performed a warm-up, then completed 4 sets of 4 repetitions with 85-90% of their 1RM in the same hack squat exercise. Critically, the subjects were informed to complete the lifting phase of the exercise as quickly as possible, which is essential for stimulating the CNS to recruit as many MU’s as it can, as quickly as possible. This intent to move the “heavy” load as rapidly as possible during the upward phase of the lift has been shown in the past to have a beneficial impact on RFD. Now, the load may not actually be moving very quickly because it’s heavy, but the effort to move it as fast as possible must be present. When the subject could complete more than 4 repetitions, the load was increased by 5kg. After the 8 weeks of training when the elderly subjects were re-tested, there was a 41% average increase in the size of the fast twitch muscle fibers, and a 32% average increase in the percentage of fast twitch muscle fibers present. 1RM in the hack squat exercise improved by 68% on average, and RFD increased by 48% on average. Before the testing there was significant differences between these scores in the young and old groups. Upon completion of the training, the 1RM and RFD values in the “old” group were similar to those of the young. This type of increase in strength and RFD, when applied to golfers would likely have a huge beneficial effect on club head speed, especially if accomplished with a more comprhensive training program that more closely resembled the needs of golf. RFD or “High Velocity” Training: Pereira et al (2012) carried out a study that more closely resembles the criteria for power or RFD training as opposed to maximum strength. 56 women with an average age of 62 (+/-5 years) took part in the experiment. The group was split in half, with 28 forming the intervention group, and 28 in a control group. None of the subjects had a history of resistance training. Both groups were strength tested in the leg extension 1RM, bench press 1RM, and hand grip strength by dynamometer. Two power tests were also carried out. These were the vertical jump, and seated medicine ball throw. I was very happy to see these two power tests included as they are rarely used in studies with more elderly populations, but are very practical and easily replicated. (They also make for great training exercises). During the training intervention the experimental group carried out 3 training sessions per week for 12 consecutive weeks. Over the course of the 12 weeks the subjects progressed from 3 sets of 10 repetitions with 40% of their 1RM to 3 sets of 4 repetitions with 75% of their 1RM in both the leg extension, and bench press. It must again be noted that the subjects were encouraged to move as quickly as possible during the upward phase of the lift. It was an explosive movement, not a slow steady tempo. This is a vitally important point. For the vertical jump and the seated medicine ball throw, the subjects progressed from 3 sets of 2 repetitions to 2 sets of 3 repetitions. This is an extremely low volume of work for the jumping and throwing. (This may have been purposefully kept this low due to the untrained nature of the subjects). From pre to post testing, the experimental group increased on the bench press 1RM by an average 61.8%, the 1RM leg extension by an average of 44.1%, vertical jump height by 40.2%, and ball throwing distance by 17.2%. No significant changes were seen in the control group. Similarly to the Wang study above, these types of improvement in strength and power would likely lead to big increases in club head speed and distance. Research results like those provided above and real world observations make the benefits of these training modalities impossible to ignore, and I always try to include them as an element of my clients training programs both in person and online. With this being said, some sense must be applied when deciding on how to train high force (strength), and high velocity (RFD) movements in older populations. In my online training programs, I try to combine research and my practical experience to provide optimal training programs for golfers. For older or less fit trainees having the experience of scaling, regressing & progressing different exercises and modes becomes invaluable. An accurate assessment of the clients readiness will dictate the training starting point, and the time and resources they are willing to commit will give an indication of where you can expect to help them progress to. Maximum Strength Training: Maximum strength training, by nature is best accomplished with exercises in an environment where high forces can be produced, and likelihood of injury or mishap is low. Basic compound movements like variations of hip hinges/deadlifts, squats, rotations, and upper body pushes and pulls tend to do work quite well in my experience. Once the athlete is competent in the mechanics of the exercise, a simple Rate of Perceived Exertion (RPE) scale is an excellent way to choose the weight to use for the exercise. Lets use the hip hinge / deadlift as an example, and you have programmed for the set to consist of 6 reps. Start with a conservative load and once the set is finished, ask the client/yourself to give the set a difficulty rating out of 10. I tell clients that 1 is nothing, and 10 is maximum effort, no way another rep would have been possible. The sweet spot is somewhere between 7-9, so adjust accordingly until you have a load that can lifted in perfect form with an RPE of 7-9/10. If technique starts to falter as the load increases, lower it to the heaviest load that can be done with perfect form. Load should never change technique. RFD Training: For golfers, the methods I utilise most for training high velocity / RFD movements are jumping, and medicine ball throw/slam variations. 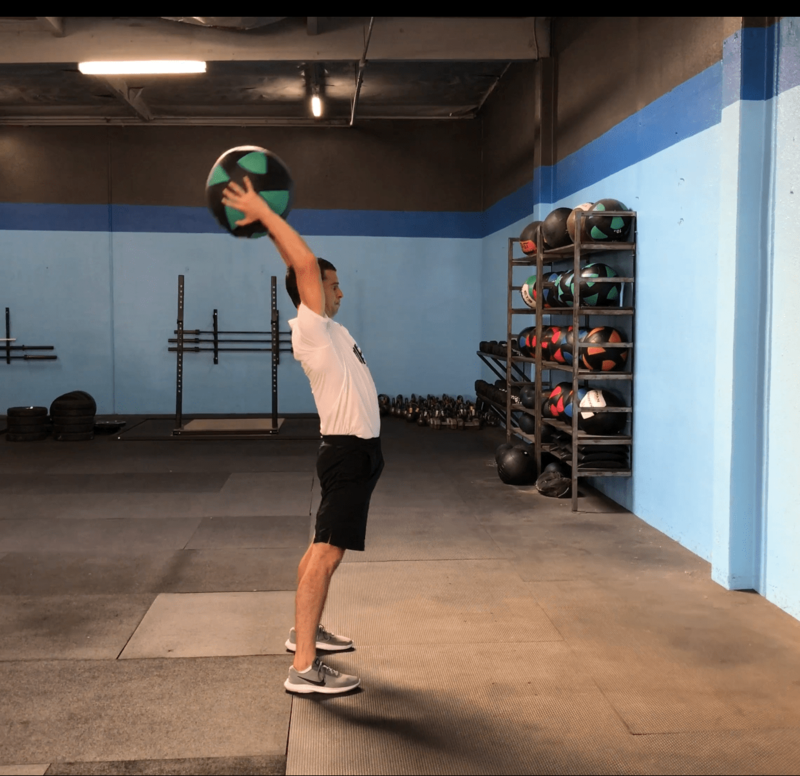 The medicine ball throw variations are usually quite simple to implement as most golfers are used to carrying out similar motions from practicing their golf swing. Jumps on the other hand can be a little bit daunting for slightly out of shape folk, or ones with lower limb injuries. I start these clients with exercises like “triple extensions” or “power step-ups” where one is still trying to produce force very quickly, but no impact from landing a jump occurs. Generally with some time, nearly everyone then progresses into a very basic jump variation like a counter movement jump or low box jump. The key concept with RFD training is that you must produce force quickly to successfully perform the exercise. Jumping and throwing naturally accommodate this. Here is an example of a counter movement jump, great for lower body power and RFD. The tall kneeling rotational medicine ball throw is an I exercise I program to develop stability and rotational power of the torso. Training & Injuries: Lack of education in regards to the benefits, uninformed comments from the media, fear of hurting one’s self / aggravating an old injury, being out of shape / too old, are the most common reasons people shy away from this type of training. “If you think lifting weights is dangerous, try being weak, being weak is dangerous”. He is exactly right. Of course precautions need to be taken and the exercise program needs to be scaled to a level that suits the individual. This is true for anything. Furthermore, improving strength levels in the appropriate movements and muscles is an excellent way to rehab old nagging injuries, and prevent injuries popping up in the future. Research is very clear on strength training aiding in injury prevention. Don’t train for strength & power, allow yourself to become gradually weaker and slower over time, decreasing your enjoyment from golf, and quality of general physical function. Take ownership of your strength & power training, take wherever you are now as your starting point, and embark on a plan for improvement…..which can be improved significantly, regardless of your current fitness level or age! Hopefully the information provided in this article has enabled you to realise the critical importance of training to keep your muscles and nervous system strong and fast. It’s one of the best investments of your time and energy for keeping your club head speed, and general physical function high for as long as possible. For a limited time you can avail of 20% off by entering “FFG20” in the coupon bar at checkout. Thank you for reading, don’t hesitate to leave feedback or ask questions. 1. Skelton, D.A., Greig, C.A., Davies, J.M., Young, A., 1994. Strength, power and related functional ability of healthy people aged 65–89 years. Age Ageing 23, 371–377.